Aloha - Oil on Canvas, originally uploaded by Jennifer Mullin. In college, I was introduced to oil paints and working with them felt so natural that I was instantly hooked. I'd been painting for years with acrylics and was successful, but once I touched oils, there was no going back. The way oils move on the canvas, their glow and transparency just could not be matched with acrylics. 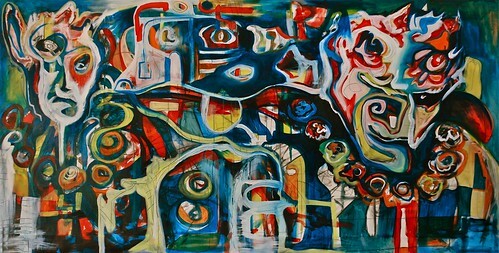 I found an abstract style that worked for me and painted like crazy through college and a couple of years beyond. Oil paint does have its constraints and over time it became more impractical for me to work with them. First, there is the smell......Though a pleasant one, it permeates everything. When I lived in Arizona I used to paint out on my deck when it wasn't 100 degrees, but that got old really fast. There is also the issue of the solvents involved. Just how do you properly dispose of them? In college, we just had a big jug that it got poured into. What was I to do at home? Long story short, I went back to painting with acrylics, then moved onto watercolors and eventually stopped painting altogether. It must be at least 5 years since I have painted with acrylics and maybe 2 years since I've worked with watercolor. This week, I completed my first oil painting in almost 10 years! My boyfriend Matt is a painter and he encouraged me to try it out again. (Check out Matt's work here.) He's got a great space for painting in his house and even stretched the canvas, so how could I refuse? We worked together on "Aloha" which measures 4' x 7'. Because it was so large, we could easily paint at the same time. His style is more fast loose, mine more deliberate, but it works and we were successful! There is already been some interest from others to buy it, but I don't think Matt would let that happen! Its currently displayed proudly in his living room, where I think it will stay for some time. I am starting a tiny 8" x 10" canvas of my own today, and I foresee much more painting in my future. I truly had forgotten just how much I love it and how good I feel when I paint. Hopefully you will see some of my paintings up on Etsy soon. ***ALOHA is available as a giclee print in Matt's shop. Click here. 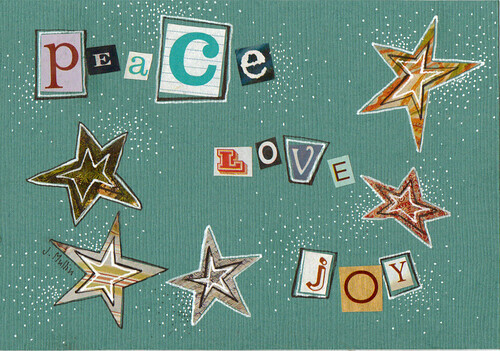 Peace Love Joy, originally uploaded by Jennifer Mullin. As the snow falls this afternoon, its truly "beginning to look a lot like Christmas." I'm feeling the holiday spirit today and decided to offer free worldwide shipping on all of my prints! Big, not so big, and tiny are all included. The last day to take advantage of this offer is Saturday, December 19th. So hurry it up!! * This is a holiday card that I designed for Winnebago County Medical Alliance. It was sent out to 800 doctors in the area. I don't currently have these available in my shop, but if you are interested in purchasing some, give me a shout. Praying for a snow day! Cheers. Hi! I cannot believe it is December already and the holiday season is in full swing. Its going to be crazy from here until the end of the year for me. 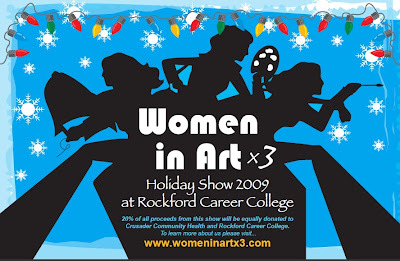 This weekend I will be participating in the Women in Artx3 Holiday Art Show. I will have a selection of originals, prints, holiday gift tags and greeting cards available for sale. 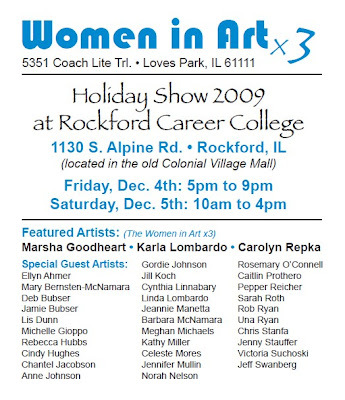 20% of the profits from this show will be donated to Crusader Clinic and Rockford Career College. So shop away and support two worthy local institutions.